Life in Mercy Hospital’s emergency room is life stripped to the bone. Housekeeper Crow Dorango, recent widow of a brilliant jazz musician, keeps her head down and her troubles to herself as she mops the floors of this inner-city ER. At this point in her life, Crow “wants nothing she can’t afford to lose.” In the hierarchical world of the hospital, she’s nearly as invisible as the ghost of Dr. Glass, who was head of the department until his untimely death in a shooting incident. The ER staff is headed by Dr. Thomas Graystone, a man enormously dedicated but also rigid and proud, thus far immune to the fevers and messiness of love. When Crow and Graystone meet unexpectedly on her turf, a Greenwich Village jazz club, a slow fuse lights between this most unlikely couple. 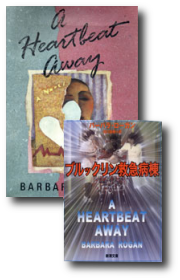 A HEARTBEAT AWAY combines an offbeat love story with a modern-day homage to Pride and Prejudice. “When my younger son was very small, he suffered from asthma and we spent a good deal of time in various emergency rooms. One stay lasted 36 hours before a bed was found and our son was admitted. By that time, I realized that I had found the setting of my next book. I was fascinated by the hierarchical structure of the ER, the divisions that ran roughly along race and gender lines, and of course the inherent dramatic potential of such a setting. When I combined that setting with another idea I’d been incubating—a modern-day rendition of my all-time favorite book, Jane Austen’s Pride and Prejudice—a kind of cross-pollination occurred; and A HEARTBEAT AWAY was born. “Evocative…entertaining…combines tart, crisp prose with just a touch of magic realism.”—San Francisco Chronicle. “Vivid as lightning bolts. Barbara Rogan…is evidence that writers are born, not made.”—Carol Strickland, New York Times. “Dramatic and moving…you’ll be easy prey for A HEARTBEAT AWAY.”—Washington Post.